Olympic medalist Laura Graves and her horse, Diddy, have learned each other's personalities over the past 16 years working together. The duo's mutual respect for one another may be the key to their success at the FEI World Games. Twenty-six-year-old rider Fouaad Mirza comes from royalty in Bangalore, and a long history with horses. In Jakarta, he carved his own piece of equestrian history. Outside of swimming and track, there was plenty of news out of Rio: Venus Williams going for gold; women's eights taking another rowing gold; and divers still dealing with green water. 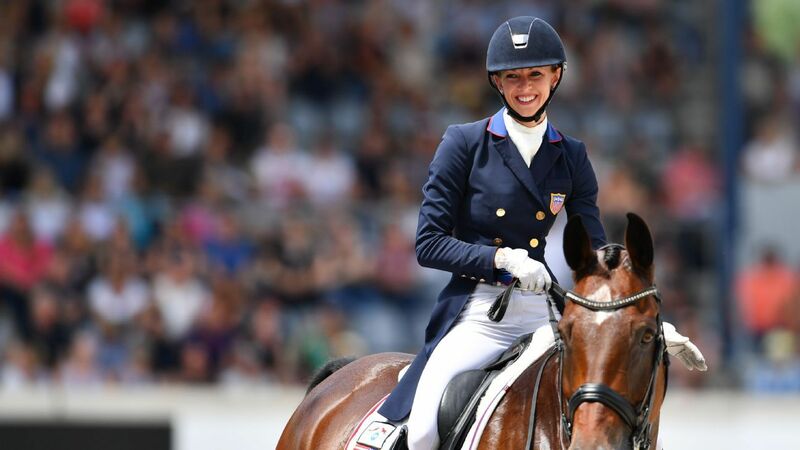 A leading Dutch dressage rider pulled out of the Olympic Games after her horse became ill in Rio de Janeiro. The U.S. women's soccer team will not contend for an Olympic medal for the first time ever, while both U.S. hoops teams, Andy Murray and Rafa all moved on. A leading Dutch dressage rider has pulled out of the Olympic Games after her horse became ill at Rio. Mary Hanna has made Australian Olympic history, becoming the nation's oldest competitor at a Games when she rode in the opening round of the dressage competition. Serena Williams didn't get past the third round, Nate Ebner got support from his Pats teammates, and an Olympian veteran medals again. Five days on the Olympic couch, and you are starting to feel as if you've hit the cobblestones in the cycling road-race and gone straight over the handlebars, Greg Growden writes. When are the Australian athletes competing in Rio de Janeiro? The WHO maintains that despite the increased number of infections because of the Zika outbreak, there is "no public health justification" for calling off the Rio Games. A champion show jumper who competed in six Olympics before coaching the United States to Olympic gold has died. Frank Chapot was 84. Philippa Humphreys, a British citizen living in Rockford, Michigan, died after falling from her horse while competing in the Jersey Fresh International Three-Day Event on Saturday. She was 33. Beezie Madden has established herself as one of the most dominant athletes in equestrian show-jumping. But as she explains to Prim Siripipat, the key to success isn't just about the rider.